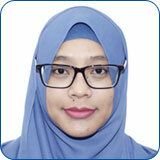 RoleSharifah's role as the molecular biology core allows her to be involved in multiple projects in TII. She utilises equipments and protocols in applications like Next-Generation sequencing (NGS) and NanoString. Currently working onSharifah is currently exploring finer molecular biology techniques to attain experimental datasets of a higher quality. She also participates in the lab daily operations to allow for a safe and sustainable working environment. Sharifah's research interests are…Sharifah's interest is in to be able to unravel datasets from experimental outcomes (NGS or Nanostring). To be able to execute experimental needs and comprehend the language of bioinformatics for diagnostic and therapeutic implementation. Long term wish toinvest in the knowledge of biostatistics and bioinformatics.